BID TOO MUCH BY MISTAKE HOW DO I FIX THIS? Auction lots close starting at 8pm EST on THURSDAYS, First lot closes at 8pm and one closes every 30 seconds after that. Softclose listings get bumped 2 minutes so at times more then one auction is closing at the same time due to the softclose. Many bidders log in and make bids during the close of the auction, the server is very busy at that time and pages will load a little slower. We suggest getting your bids in early and using a proxy bid but please feel free to log in at the end of the auction to keep an eye on your items and to sneak in any last minute bids. It does get exciting at the end with everyone bidding. MSRP: If a value is mentioned on a listing please do not assume this is the best price you can find this item for anywhere in the world! Yes, Some people seam to think that. With new products if a price is mentioned it is usually the going rate taken from either another auctions site, a popular online retailer, a MSRP or a estimated value. Used items may indicate the item was originally purchased for a value, this does not mean it currently holds that value. Some things go up in price and some go down. If it says the price is 100.00 and you find it online for 60.00 then we suggest you stop bidding at 58.00 (or keep bidding we don’t mind!) just do your homework before bidding as once that bid is placed we WILL NOT retract it cause you found it cheaper somewhere else. ESTIMATE PRICE: This is a opinion from either a consignor or the auction staff as to the estimated value of the item. This does not mean you can not find it on sale somewhere else or it has sold in the past for more or less this is just an opinion. -Chance are you have not logged in or got logged out. -To fix this hold down your CTRL button and click the MINUS (-) sign a few times. This will force the screen to shrink to fit on your page. WE DO NOT USE BOTS!Consignment auctions like ours have no reason to use a BOT. Any real auction house that takes consignments will not even consider a BOT. New product auctions such as penny auctions are the ONLY auction sites that we know of that use these bots and this is public knowledge as an ex employee of one of the big penny auctions spilled the beans just like the dating sites using bots was exposed to the world. You pay your winning amount plus 13% HST TAX. 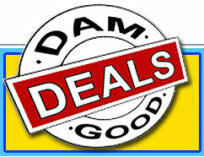 No, sorry at this time we do not offer any shipping options from the damgooddeals auction site. All items are to be picked up in person. Invoices are generated a few hours after the auction closes. If you are bidding on items this week please check your INVOICE page the day after the auction closes to confirm the items you won. Items will be moved from your bids and status page to your invoice page. Please do not rely on email to tell you if you won or were outbid. Emails often get stopped or filed as spam/trash/bulk so they are unreliable. Check your INVOICE page on Monday to see if you won anything that needs to be picked up. If you do not see the item on your invoice on Monday then contact us but chances are you were outbid and just did not realize it in time. IF A LOT WAS LISTED WITH THE WRONG PHOTOS OR DESCRIPTION If we catch it in time we will remove the bad lot and let the bidders know what happened. If we miss it and it’s sold to two different people the winning bidder is under NO obligation to take the items if the photos or the descriptions do not match the actual items. Unless it is a lot where we have multiples (Sometimes with jewelry and new products we have or can obtain more of the same items from the consignors or suppliers) we will do our best to appease each bidder. Most of what we sell is used goods so we would not have TWO the same to award to each bidder. so… If we accidentally put TWO lots with the SAME photos and the SAME lot numbers we will contact each winning bidder and try to resolve the issue fairly if no resolution can be made we will relist the item. IF BOTH PARTIES IN A DISPUTE DISAGREE ON RESOLUTIONWe simply relist the item and apologize for our mistake. Putting up as many lots as we do each auction we are bound to make a mistake once in a while and boy are we embarrassed and apologetic when we do.